How much is 4000 acres? Seeing it on the map and comparing it to last summer's relatively small Bonny Doon/Martin Rd. fire is staggering. 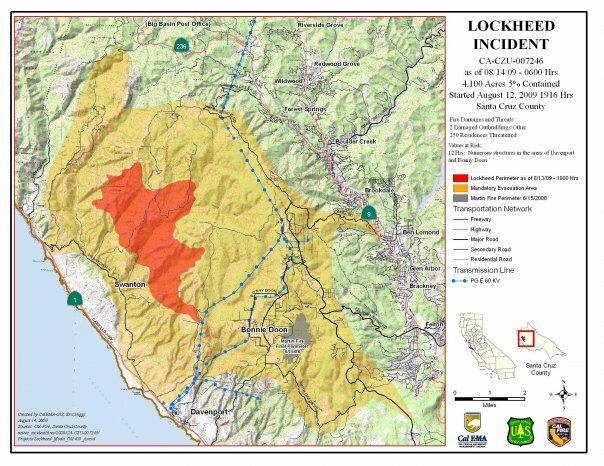 Realizing that the fire is as large as the entirety of Bonny Doon -- or put another way, as large as all ...of Boulder Creek, Brookdale, and Ben Lomond combined -- is mind-blowing. It started me thinking how our political ideals play out in real life. As independent or federated communities, how would we deal with such a situation? And why wait for an anarchist utopia? What can we do now to be helpful and support communities that are in need now? In that vein, we created a network to help evacuees find housing at SubRosa in downtown Santa Cruz. Offer Housing: If you have temporary housing -- a spare room, a couch, a backyard in which to pitch a tent -- to offer, come down to SubRosa and list it on the board. Evacuees: If you are seeking temporary housing, use the housing list at SubRosa to find a place.